Welcome to Nico Nico seiga!! Today I’m going to show you Nico Seiga, this is Nico Nico’s “deviant-art” so to speak. It has plenty of Manga Anime and MMD art works! It contains everything from good to bad! You can log into Nico Seiga using your normal Nico Nico Douga sign-in! Nico Seiga is home to all sorts of anime and art whether it is fan-service or Just your normal Miku model. This is a perfect masterpiece drawn by はころくさん of the Love Live School Idol Project Characters! 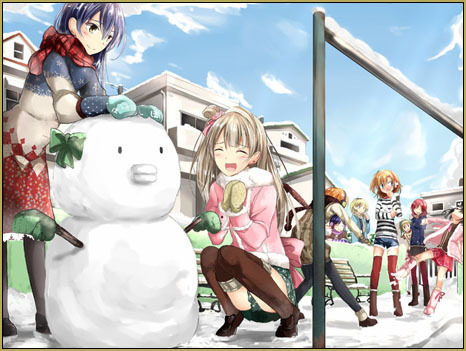 Normal art work is displayed as a plain image with comments next to it, but Manga is displayed in a completely different way. There, you can add your own comments on top of the manga!! The comments will slide across the screen just like comments do in videos! Below that, your going to see some news, and an advertisement, after that will be works that were commented on recently. Along with their Featured Daily E-Book and Popular POP. Popular Pop is where another user can “pop” your work to show they like it. When a pop’ed illustration gets popular enough it goes into the popular pop section. the normal artwork rankings. The rankings will go down the rest of the page. Next to the rankings will be Featured tags and Events. All of that is just Nico Seiga’s front page. Nico Seiga has pages for each type of art. You will notice they have tabs near the top of the page. 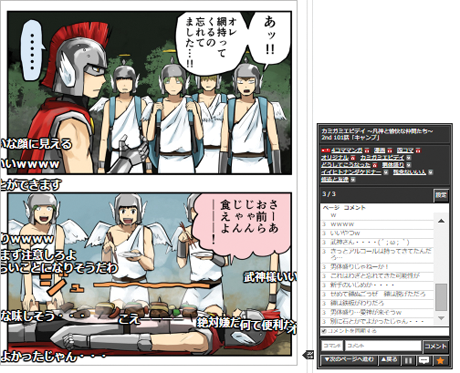 The first tab is the home page, The second tab is the “Illustration page”, Third is the manga page, Fourth is the E-Book Page. I highly suggest none of you visit the E-Book page, I haven’t seen the e-book page but according to my parental controls it has… super mature R-rated stuff! Which is bad! The Illustration page has a featured tag box at the top of the page. Similar to the home page it has art work, but it links to tags and not peoples art work. 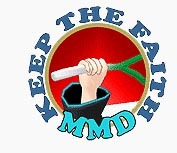 You’ll notice one of the first ones is MMD, check it out here. It also has Minecraft as a tag! Below that, you’ll see an orange button with some white Japanese text on it this literally translates to “I post illustrations” We’ll get to the uploading later! For now let me tell you about the illustration page. Next to the button you’ll see the soaring illustrations “急上昇イラスト” This means illustrations that are getting comments faster. Below that you’ll see “開催中のイベント” or Events being held. Below you’ll see the hourly ranking. The hourly ranking ranks “創作” or Creative meaning a character(s) you’ve designed yourself,” ファンアート” Fan-art, and “殿堂入り” Hall of fame I’m not entirely sure why this was put in the hourly ranking. After that you’ll see the Featured Tag “注目のタグ” which right now happens to be コーヒー or coffee! Below, you’ll notice the New illustrations or “新着イラスト”. Last but not least of the page you’ll see the タグ一覧 tag list. The last page I’ll be showing off today is the manga page (マンガ). Sorry everyone, E-Books are just to inappropriate!!! At the top of the Manga page you’ll see about 18 manga’s (or mangai, my secret plural for manga) that you can scroll through! Below that you will see the “公式マンガ” Official Manga, “最近コメントがついた作品” Artworks recently Commented on, and the Hourly Ranking. I cannot say this with absolute certainty but I believe Official Manga pertains to Mangas being published. 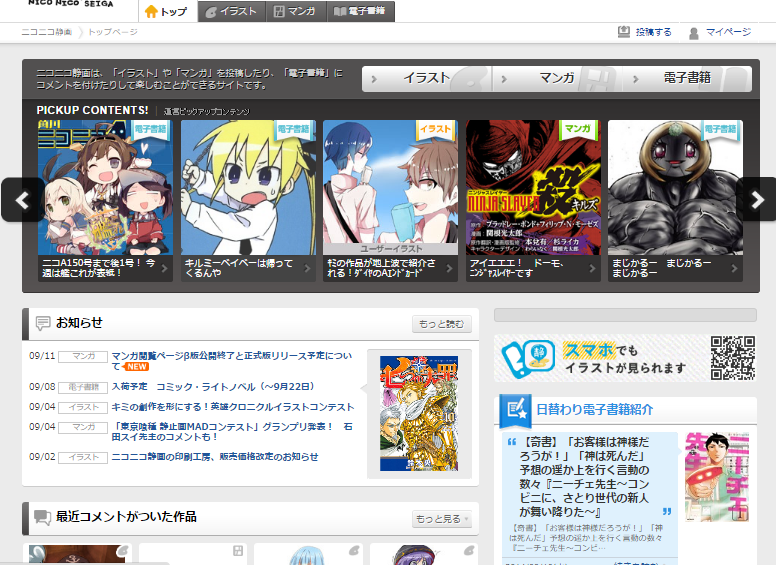 Below the Recently commented manga you’ll see featured manga and below that check the “最近更新された作品” Recently updated Manga. Now lets get to uploading!!! Notice the upload button on the right side of the screen, between the page and the tabs? It should say 投稿する meaning “post”. You’ll see two columns, an orange column and a blue column. The orange column is for single still artworks or pictures. The blue column is for Manga and EBooks. Down at the bottom of the columns you’ll see Mr. Nico as I like to call him. (I don’t think he has a proper name) He looks like a TV with a leaf sprouting out of it. Mr. Nico will guide you to the upload pages for Manga/Pictures by clicking on what he’s saying. Remember Blue for Manga and Orange for Pictures! Meet Nico Seiga’s Mr. Nico!